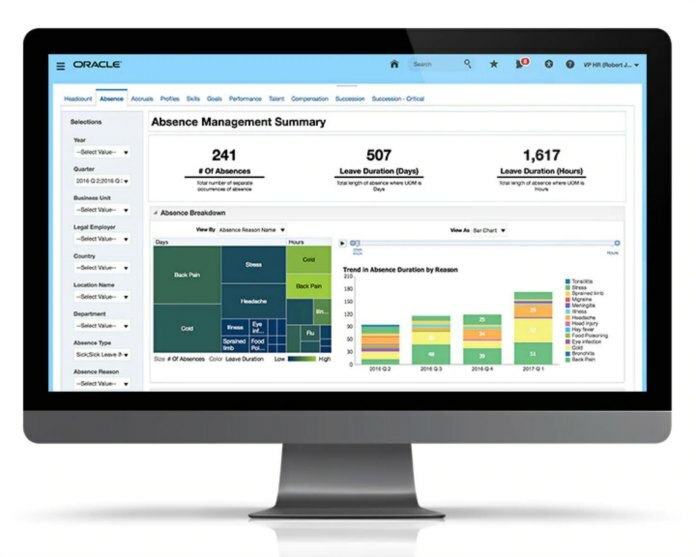 The latest additions to Oracle HCM are designed to help customers compete more aggressively by providing HR with the tools it needs to make contributions to the business that go beyond the workforce. “We’ve done a lot of thinking and work around how we integrate HR with the rest of the business suite so that they can align their organizational structure and people strategy to support the growth of the business,” Emily He, Oracle’s senior vice president of marketing for HCM, told us just before the conference. As organizations confront continuous changes in the competitive landscape, technology and markets and their own structures through M&As, it’s become particularly important for them to align their people and business strategies, she said. That’s the context in which Oracle announced new AI and other updates to HCM Cloud. “The latest innovations help HR teams reimagine people and talent processes in order to build stronger teams faster, reduce employee turnover and enhance the employee experience,” the company said in a press release. Note the emphasis on employee experience. “The constantly changing expectations of candidates and employees is one of the biggest challenges organizations face today,” observed Chris Leone, Oracle HCM Cloud’s SVP of development. Those changing expectations lead to escalating recruiting costs and increasing turnover, he said, and they’re changing so quickly that most companies can’t keep up. “By continuing to integrate the latest in artificial intelligence and machine learning within Oracle HCM Cloud, we are helping our customers simplify the complex and deliver the best possible employee experience,” Leone explained. A scalable HR concierge with digital assistants to both increase employee engagement and improve HR productivity. Through chatbots, employees will be able to get answers to common HR questions more easily, without the intervention of HR staffers. A responsive mobile experience provides employees and managers with a consistent and personalized experience on their desktop, tablet or mobile phone. Configurable action lists for represented worker processes will simplifying practices, policies and procedures by automating contract management for union workers and others covered by collective bargaining agreements. New integrations with LinkedIn simplify sourcing candidates by providing a more efficient recruiter experience. The integrations include automated sourcing, candidate search, referral recommendations and recruiter system connect. The integrations with LinkedIn also should help HR retain employees by growing their internal talent pool, increasing internal mobility and enhancing career development opportunities. Smart sourcing allows recruiting teams to go beyond standard job profile matching to consider factors such as likelihood to accept, predicted performance and expected tenure. My Brand strengthens employee engagement by helping employees hone skills and build personal brands by driving collaboration and enabling mentor recommendations. Self-learning risk management with advanced HCM controls is designed to lower the cost of regulatory compliance, prevent fraudulent payments and increase the separation of duties by detecting access anomalies and strengthening security and data privacy. Strategic workforce planning allows HR to be become more proactive in planning and optimizing the workforce, assessing talent and skills gaps, visualizing predicted impact on headcount and cost, and structuring the organization to support today’s pace of change in business. The HCM Experience Design Studio is intended to increase employee satisfaction and HR productivity by creating employee experiences that align with company culture and enabling HR to configure, personalize and simplify processes without help from IT. Oracle, she said, approaches its product development with the idea of technology being an enabler—user needs should drive the tools rather than the tools drive user needs. Businesses, she believes, have always cared about employees, but now the labor market has forced them to pay more attention to how work getting done aligns with how employees live their lives outside of company time.